Fire coming from your exhaust tips will definitely turn heads at car shows and of course on the road. 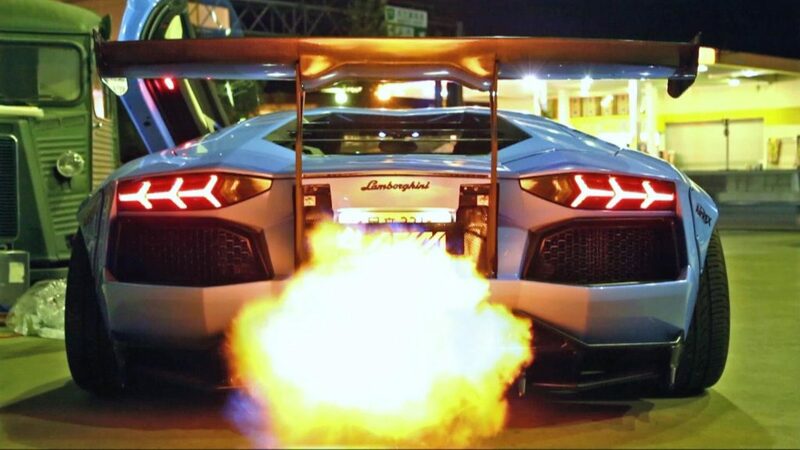 Unless you have a car such as the Lamborghini Aventador that from factory shoots flames, you will almost certainly need modifications. Methods such as adjusting the air to fuel mixture, anti-lag/two step systems and ecu remapping should be done with caution. Although fairly safe, excessive use may result in damage to various components such as the manifold. The number one way fire comes from your exhaust is due to unburnt fuel that is in the exhaust system, which catches fire. How do we get unburnt fuel to enter the exhaust system? There are many solutions to this that include spending money and being on a budget. There are also methods to increase the likelihood of fire that involve using car exhaust flame kits. WARNING: Flames from your exhaust is dangerous and must be done safely. Failing to do so may end up with a police fine or injuring someone. It is also worth mentioning that you should check laws within your state with regards to the legality of shooting flames from your exhaust. The easiest and safest way to get flames from your exhaust is to purchase a flamethrower kit for your car. This comes in the form of the Hot Licks flamethrower kit that is made in the US and comes with a lifetimes warranty and instructions. Hot Licks provide this kit for both dual and single exhaust systems and has everything that you require to produce flames from your exhaust. They claim that with some additional modifications, you are able to produce flames up to 12 to 24 inches, which is fairly impressive. Probably not the most sophisticated method in the world but a spark plug will produce impressive flames. In short, you connect a spark plug a short distance (5-6 inches) from the end of your exhaust and have wiring to the driver to ignite it. The ignition wire used to ignite the spark plug should be attached to one end of the spark plug and the other end to the switch. The switch wire will continue to be attached to the positive terminal on the battery. For a bit of fun, this method is worth a try but it shouldn’t be used as a daily practice. The flames from a spark plug are known to be very large, therefore take caution and be sure to look around before shooting flames. Modifying the air to fuel ratio of your car is method used by myself (by accident) that resulted in very loud pops, bangs and flames from the exhaust. This method can be done manually in most older cars and via a custom tune in modern cars. Running a rich mixture has the effect of blackening your spark plugs, excessive petrol consumption, lumpy tick over and more. Overall its not a pleasant experience but you can still drive the car if you just want to be able to spit flames from your exhaust. One of the more popular methods of getting your exhaust to shoot flames is by ECU programming. With use of a car tuning computer, you are able to tweak certain settings that will assist with unburnt fuel entering the exhaust system. However, if you do not own such a device, most car tuners will be able to do this for you at a small cost. There are even specialists companies that have designed a smartphone application which allows you to switch between different maps. This means you are able to switch between performance, economy and of course, shooting flames through you exhaust without being stuck on just one of the maps. In short, the ECU reprogram will require the car not to cut fuel at high revs with a closed throttle. This has the effect of fuel still entering the engine, which will also flow to the exhaust as unburnt fuel. This unburnt fuel will of course result in many flames. The Antilag system is fairly common within the modified car scene and works by combusting fuel after the engine but before the turbo. This has the effect of keeping the turbo spinning when there is a lack of exhaust gases. The main purpose for Antilag is to reduce turbo lag and as a side effect, it creates great flames from the exhaust. A Two step system is used to increase the effectiveness of your standing acceleration. Similar to launch control but a Two step system is seen as having two rev limiters whereas launch control is more electronic. This means it will hold the first rev limiter and fuel will continue to enter combustion chamber but it will not ignite due to the Two step system. This has the effect of the unburnt fuel flowing to the exhaust system that produces flames. If you car has a rotary engine such as the Mazda RX7 or various RX8’s, then you will be one step above the game. Rotary engines by standard run richer than normal engines, which means there is more gas than air in the air to fuel mixture. A rotary engined car with a straight piped exhaust is more than likely going to shoot flames from the exhaust. Therefore you may not be required to perform further modifications in order to create the impressive flames you desire. Cutting out your catalytic converter and replacing it with a straight pipe exhaust can sometimes be more than enough. Not only does it make the car sound more aggressive but it also increases the likelihood of flames coming from your exhaust. However, before getting a grinder out to rip the catalytic converter, you must remember that this will increase emissions. All cars must go through inspections and this will be a test (as well as noise) and may fail. Before trying to modify your car to produce flames, you should test whether the addition of a straight piped has invited flames from the exhaust. To increase flames from the exhaust, you will want your car to get warm then accelerate hard and then remove your foot quickly to shut the throttle. This will send unburnt fuel down your exhaust to produce flames.